Autumn is by far my most favorite time of the year. Everything slows down a little. The frenzy of the summer is over. The air conditioning is turned off and the windows are thrown open. As we enjoy the cool breezes, the trees start their end of year dance. Juicy green apples appear on the fruit stands, deep red Japanese maples glow in the gardens, and bright yellow gingkos line up along the boulevards of Tokyo radiating like street lamps. Just as the trees turn to fire and their leaves litter the ground, Mirasaka Fromage ships out its most beautiful cheese — Jyukushi Kaki — a washed-rind cheese made in the shape of a persimmon. It even has a little persimmon leaf hat and blanket to keep it warm, too! It’s a stunning cheese that evokes all the beauty of autumn. There are so many parallels between cheese and autumn. In truth, they're both appreciated forms of decay and degradation. The cheese will not be worth eating for much longer, and autumn will descend into winter once the trees lose their leaves. We must enjoy them now or risk the bitter regret of knowing we didn’t take advantage while we could. So let’s eat up and then take a stroll through the park! My first cut into Jyukushi Kaki was painful because it felt like cutting into artwork. This feeling quickly dissolved into delight as I saw the cream line melt out onto my knife. It was salty, with warm butter and thick cream, but still light with an airy paste. As delicious as it was, I was mostly eating with my eyes and soaking up the beauty of a well-crafted cheese. Mirasaka Fromage will be getting an early reservation every year from me. Jyukushi Kaki is made every year in limited numbers and flies off every shelf it actually makes it to. I had mine delivered to my home directly. No middleman for such a precious piece of cargo. Hiking in the Alps, whether European or Japanese, requires a well-fueled picnic. Most of my experiences in the Swiss-French Alps as a kid included a hearty lunch in a field. It always included some salami, bread, a chunk of hard cheese, and a knife. Because smell is so intricately connected to memory and experience, one whiff of Gruyere or a Tomme de Savoie can transport me back to those grassy slopes. When I cut into one particular Japanese cheese, suddenly, my small Tokyo apartment opened to the mountains. Grande Shintoko is as close to an alpage-style mountain cheese as it gets in Japan. From a small valley in Hokkaido, it is made with the best milk of the past summer and aged up to a year. The rind is splotched with deep rust-colored reds, nutty browns, and small blooms of grey and white molds. The colors seep through the thin rind into a paste radiating warmth and nuttiness. It tastes of buttery, toasted cashews and finishes deep and long. Now that summer is here, it’s time to grab some dried meats, a sturdy knife, and a chunk of Grande Shintoko before wandering into the mountains. Tokyo’s sakura season is watched like an incoming storm. The news and everyday conversations fill with predictions, planning, and excitement. The frenzy picks up as the blooms follow the warm weather north. These little pink flowers herald the arrival of spring. "Sakura" is Japanese for a flowering cherry tree. Even before the sakura bloom, across the country everything turns a shade of pink. It starts with the food and drinks. For the season, every label is adorned with little pink flowers. Everything than can be is flavored cherry-blossomed. Even the beers are more festive. Once the sakura petals fall, like soft pink snow blowing through the streets, the frenzy calms and the world turns green. This all happens in less than three weeks. These beautiful flowers bud, bloom, and fall like a poem in the spring breeze, reminding us that the most wonderful things in life are not meant to last forever. And thus, they should be cherished. Cheese is a wonderful mirror of the sakura blooms. Each demands an appreciation for the passing of time. With age, cheese grows and develops. But it also sours and degrades. The sole guarantee is that the cheese will change. Japanese cheese is one part of this seasonal consciousness. 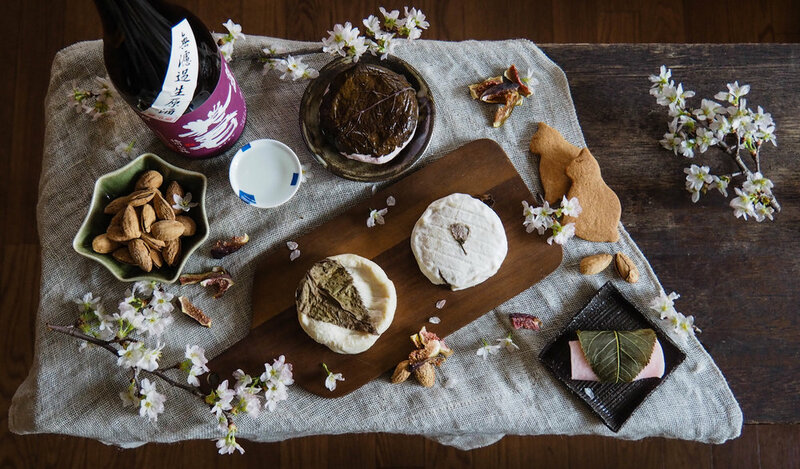 In tribute, Japanese cheesemakers celebrate spring with their own unique touch. Check out a three of our favorites below. This cheese exudes all the beauty of a cherry blossom. Besides the elegant flower bud placed in the middle of the round, the cheese is covered in a soft, pillowy white mold. Inside it is pure and white, with a thin cream line under the rind. On the tongue, it melts in your mouth with a faint acidity and light saltiness. This is not a pungent cheese, but one made for the Japanese palate. Its flavors are more refined and nuanced. Originally just an aging experiment by the cheesemaker, Sakura Affine is a beautiful example of how aging can produce an entirely new array of flavors and textures in a cheese. Sakura Affine is the evolution of the original Sakura round after 1 month of aging. Given the time, the hues of the stark white paste get warmer and more mellow. The cream line takes over and softens the whole round, creating a cheese that is melty, rich, and creamy at room temperature. Wrapped in shiso leaves and bathed in plum vinegar, Natchi is a cheese of color contrasts. The strong whites of the cheese contrast with the dark shiso leaves and the pink-hued vinegar. The cheese itself is firm and milky, with vibrant flavors from the leaves and vinegar. A salad is the perfect platform for this unique mix of Japanese ingredients. The archetypical flavors of Japanese cuisine include dashi, soy sauce, mirin, ponzu, Japanese mayonnaise and the brown sauce that covers okonomiyaki and takoyaki. Never to be left out is miso. An ingredient so essential that it accompanies every meal, preserves vegetables out of season, and flavors an array of dishes to make them healthier and irresistible. Miso is made from fermented Japanese soy beans. In traditional production, miso is aged in large cedar wood vats with stones piled on top to encourage a slow fermentation over several months. The flavor distinctness between traditional and modern miso production parallels the differences between artisan and processed cheeses. Processed miso is just not as delicious or healthy! A flavor so connected to Japan’s food culture is also remarkably good with cheese. A few cheesemakers noticed this on their own and brought the flavors of Japan to their craft. Cheeses are mixed with miso, preserved in miso, aged in miso, or simply covered in miso for the extra flavor effect. Each one creates its own fermented flavor explosion. Orchard, one of Handa Farm’s three cheeses, is aged for 3 months before a second round of aging in miso for 6 months. This cheese is made through a collaboration with the long-established miso producer, Tamuraya. The miso is deliciously tangy, and salty, but with a lingering sweetness. The cheese absorbs the flavors of the miso, becoming richer as the flavor deepens. Orchard is packed in the same miso to help preserve the cheese and allow the flavors to continue developing. Chunks of the miso-smothered Orchard paired beautifully with slices of apple. The tartness of the apple brought out the tangy-sweetness of the miso perfectly. This miso cheese is light and approachable, with less of the heady fermented flavors. It is delivered in pre-cut cubes of gouda cheese that make the enjoyment of it effortless. Nagato Farm uses the traditionally made Suyamo miso from Shinshu, a local Nagano miso producer. Nagato Farm loves pairing its cheese with a complementary fermented food. They recommend chopping it and putting it in onigiri (rice balls) or over rice. Or simply grab some toothpicks and enjoy alongside beer, shochu, or sake. Fromagerie Alpage is first and foremost a cheese shop, but they also make some fresh cheeses in house. The miso is hand ground and smothers the mozzarella. It is a stronger miso with a very light and chewy mozzarella cheese. Enjoy it like the Japanese: slice it, add a little soy sauce and dig in with chopsticks. Or make a Japanese caprese salad with colorful daikon. Foreigners tend to stand out in a country as homogenous as Japan. Many are bigger in voice and body, attracting attention from the calmer, quieter Japanese. As much as we try to fall in step, we’ll always do something a little different. Pulling 2 stinky cheeses and a cheese board from a bag at a sumo match did nothing for my blending in. Taking pictures of blue cheese during the bouts was challenging - watch the bout or focus on the cheese? I wanted to study some Japanese blue cheeses and thought that a long day of sumo would be a fun place to try them and take pictures. I brought 2 blue cheeses, Atelier de Fromage’s Fromage Bleu and Niseko Cheese Factory’s Sky [ku:]. It was fun juxtaposing the flavorful blue cheese with the powerful sumo wrestlers. Thus developed a themed bout between blues, Nagano vs Hokkaido. Bout: term for a sumo match between two wrestlers. Both Japanese blue cheeses are award winners, so the bar started high. Atelier de Fromage hails from the mountains of Nagano. It won 2 major awards for Fromage Bleu, the Grand Prix at the 2014 Japan Cheese Awards and the Super Gold at the 2015 Mondial du Fromage. The second cheese is Sky [ku:] from Niseko Cheese Factory, found in the famous ski town of Niseko, Hokkaido. It won the Bronze at the 2014 Japan Cheese Awards. Atelier de Fromage’s Fromage Bleu is decidedly creamier and more pungent. It is a salty blue cheese with almost no hint of sweetness. It pairs incredibly well with a light honey. The blues of this cheese are darker with strong lines coursing through the creamy paste. Its pungency and rich flavors appeal easily to the Western palette. The Niseko Cheese Factory’s Sky [ku:] is a harder cheese, resembling an aged blue. It breaks into small crumbles that are light and deliciously salty. The blue mold runs through the cheese in small streams, seeping into the paste at all turns. This is definitely a great blue cheese for people who are not used to stronger flavors or would prefer a less pungent blue. Blue cheese is made all across Japan with growing popularity domestically as people get used to its particularly delicious stink (biased, of course). For a more traditional blue that is rich, creamy and pungent, Nagano’s Atelier de Fromage satisfies all desires. For a new experience and especially if you’re a blue novice, Niseko Cheese Factory has the answer for you in its Sky [ku:].